 Tarzan befriends Dr Celliers, a UN doctor, and his attractive nurse, Jill Hardy, when he visits their jungle hospital for medicine for a young elephant wounded by a group of vicious white hunters who have invaded the district. Celliers agrees to let two UN photographers accompany him into Sukululand, not realising that they Burger and DeGroot, hunters keen for access to this prohibited game-rich area. Tarzan realises their true purpose and warns them to stay away from his jungle friends (left). Jill and Tarzan band together to find and warn Dr Celliers but when they reach the Sukulu village they are both taken prisoner by the villagers who blame them, as well as Dr Celliers, for bringing the evil white men who have driven off the animals. Tarzan escapes into the jungle and calls the animals back across the river to Sukululand and Burger and DeGroot are crushed in the stampede. 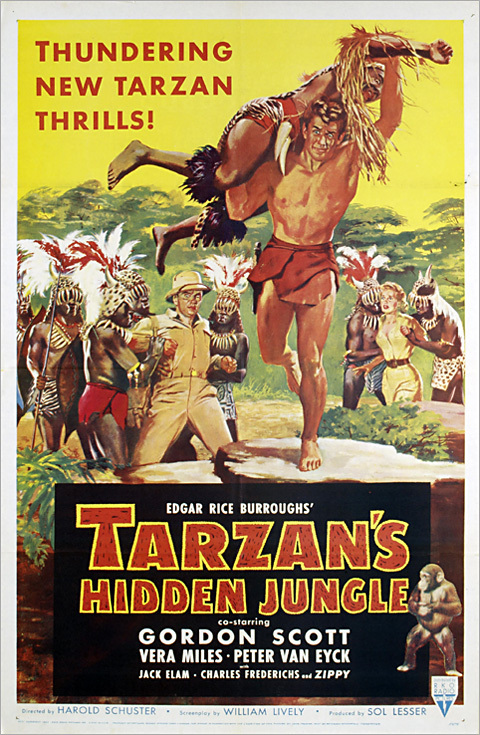 When Tarzan returns to the village he arrives just as Jill and Celliers are thrown into a lion pit. He leaps in and drives off the lions. The Sukulus free Jill and the doctor and are grateful to Tarzan for bringing back their animals. Tarzan bids farewell and disappears into the jungle.